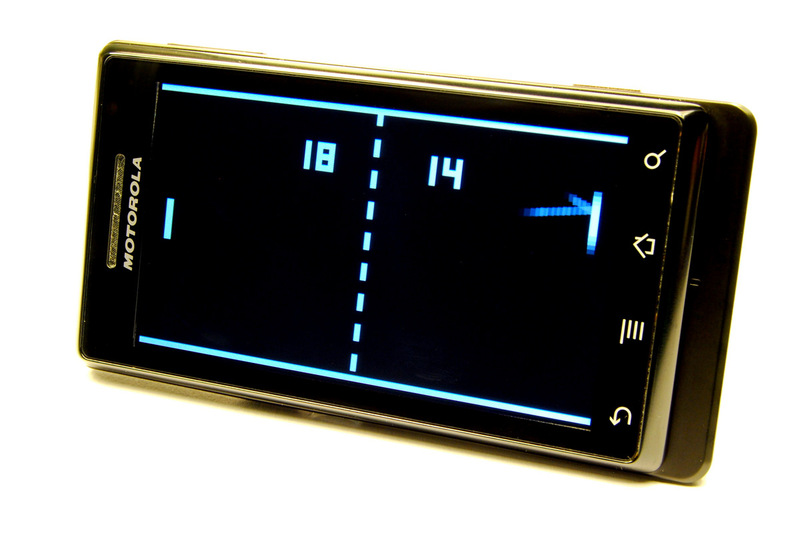 This is a Pong clock for your Android phone. It tells the time by playing Pong against itself. Sander Muller came up first with the idea to have a Pong Clock. A really great idea and a fantastic device. Then lately Lady Ada designed a wonderful hackable clock platform, called MONOCHRON. The first implementation on the platform was, of course, a Pong Clock. As I received my new Android phone, a Motorola Milestone, I was looking for a simple project to get my hands dirty. So what could be more obvious than writing a Pong Clock. If you want to take a look at the source, check out my PongTime repo at github. The code is not pretty as can be, mostly because of optimizations to get rid of object creation and thus garbage collection. If you are reading this with your Android phone, you can grab the Pong Time app directly in the Android Market. Otherwise search for “Pong Time”. For my latest projects I used a lot of single cell lipo batteries. They are really nice. High power density, low self-discharge, no memory effect and they can deliver quite an amount of current. But lipo battery handling is a bit more complicated as with other rechargeable batteries. You have to take care of under voltage and over charging as that may destroy the battery. 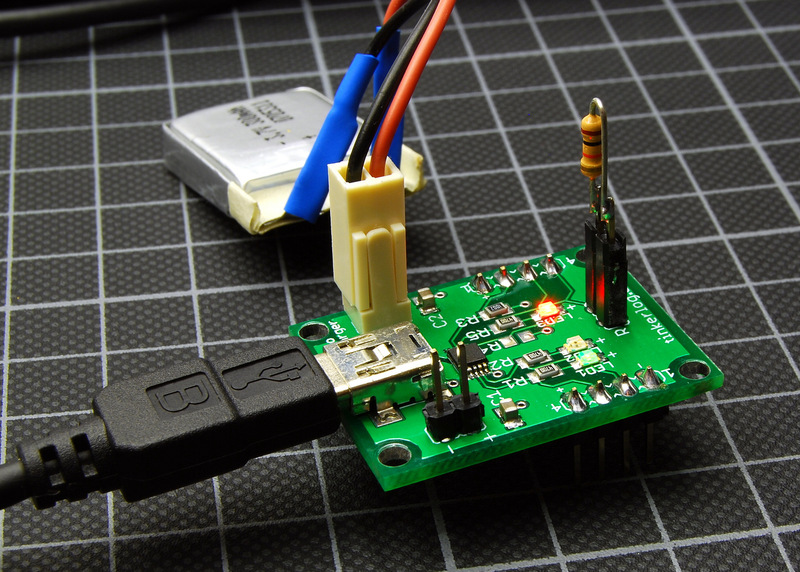 I used the Sparkfun LiPoly charger, based on MAX1555, for some time and it works really well. The only thing I missed was a way to control the current. After some research I decided to try another chip, the Microchip MCP73833. While we were at cheating, here is a new sticker for your notebook. It helps you to read and learn resistor values. The first 10 direct messages to me will get one for free. 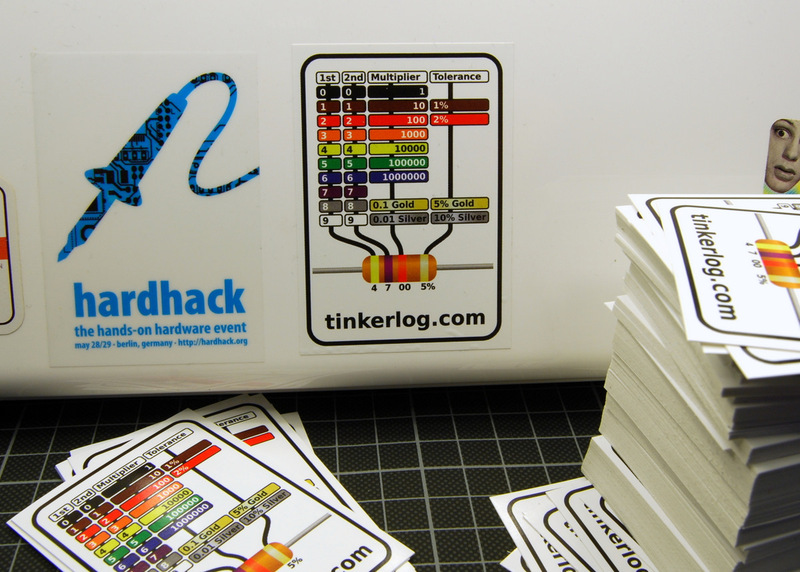 And of course every next order at the Tinker Store will include one of these. Update: Sorry, the shop is closed. The last couple of weeks I have been busy to put up a store for my kits and now I am glad to announce the one and only Tinker Store. The very first two kits are the Programmable LED and the Synchronizing Firefly. Along with the kits I did very detailed step-by-step instructions on how to assemble and solder them. Check them out on the HowTo page. If you encounter any problems with the shop, then just drop me an email and I will fix it as soon as possible. This is for Mac OS X only, sorry folks. say -v Cellos "Dum dum dum dum dum dum dum he he he ho ho ho fa lah lah lah lah lah lah fa lah full hoo hoo hoo"
If you are brave enough, copy’n’paste the snippet below, replace USER and PASSWORD with your twitter account and it will read out loud the latest tweets of your friends. Thilo and I have been in Berlin for the last three days from 27th to the 29th, attending to the 24c3. It has been the first time for me beeing there. The 24c3 is one of the biggest events in Germany and Europe where geeks and hackers get together to talk, to hack and to have fun. It is a pitty, that I found out that late that there is such a cool event every year taking place only some hundred kilometers away. Anyway, I will be there again next year.